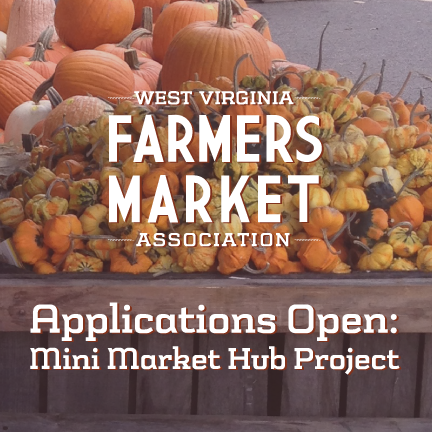 The 2018 success of the Mini Market Hub Project has allowed the West Virginia Farmers Market Association to reopen the application process to accept two additional farmers markets into the program for 2019-2020. Applications are open from now until midnight January 7, 2019. In 2018, the WVFMA partnered with various organizations to develop and expand the existing local food network of farmers markets into their respective local communities. Four regionally diverse members of the association were selected to implement plans for aggregation, distribution, and production. Some areas of focus for these markets include but are not limited to: operating with a regional distributor, developing plans and implementing farm-to-school programs, mobile markets, and Community Supported Agriculture (CSA) programs. Markets accepted into the program will be provided funding for a market manager or data collection personnel, technical assistance for creation, evaluation, and implementation of their ideal expansion, and an allowance for equipment or supplies. Farmers Markets who apply must be members of the WVFMA for 2019-2020. Farmers Markets must have completed the 2018 Census. A manager or representative must be able to attend the 2019 Small Farms Conference on February 16, 2019 at 9:45am in Charleston, WV. Once you’ve completed the initial application, you will be contacted to set up an over the phone conference interview with the WVFMA selection panel. Those interviews will take place between January 14 through January 25, 2019. An announcement will tentatively be made the week of January 28, 2019 regarding the outcome of the selection process. Previous applicants are encouraged to apply. Please contact Erica Gallimore, WVFMA Project Coordinator, at 304-202-6618 or erica@wvfarmers.org with any questions or concerns regarding this project.